An herb characterized by its long green shoots that are used as a seasoning in food dishes to provide a flavor very similar to a very mild onion. Although dried chives are available, they are best as an ingredient when they are fresh. The shoots should be snipped with a scissors right before they will be used so that they retain their flavor and crispness. If cut prior to being prepared, store them in a refrigerator and prepare within a few days. 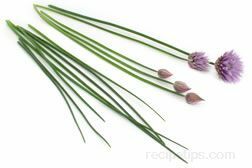 Regular chives are also considered to be European chives, which provide a mild onion flavor to foods. Another common chive is the Garlic chive, which is also referred to as the Chinese chive. As can be assumed by the name, the Garlic chive provides a noticeable flavor of garlic. Chives go well when paired with a variety of vegetables and potatoes. It can also be used nicely to flavor poultry, fish, sour cream toppings, sauces, cottage cheese, and herb butters. The flowers on the chives are also edible and may add color to your dish.